It has been suggested that this article be merged into Acedia. (Discuss) Proposed since February 2019. Acedia in The Seven Deadly Sins and the Four Last Things, by Hieronymus Bosch. Sloth is one of the seven capital sins. It is the most difficult sin to define, and to credit as sin, since it refers to a peculiar jumble of notions, dating from antiquity and including mental, spiritual, pathological, and physical states. One definition is: a habitual disinclination to exertion, or laziness. Views concerning the virtue of work to support society and further God's plan suggest that on the contrary, through inactivity, one invites sin. "For Satan finds some mischief still for idle hands to do. Satan is the God of sin, the underworld and all things evil." ("Against Idleness and Mischief" by Isaac Watts). The word "sloth" is a translation of the Latin term acedia (Middle English, accidie) and means "without care". 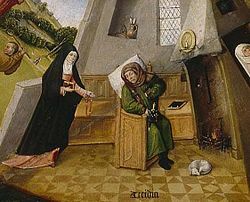 Spiritually, acedia first referred to an affliction attending religious persons, especially monks, wherein they became indifferent to their duties and obligations to God. Mentally, acedia, has a number of distinctive components of which the most important is affectlessness, a lack of any feeling about self or other, a mind-state that gives rise to boredom, rancor, apathy, and a passive inert or sluggish mentation. Physically, acedia is fundamentally with a cessation of motion and an indifference to work; it finds expression in laziness, idleness, and indolence. Two commentators consider the most accurate translation of acedia to be "self-pity," for it "conveys both the melancholy of the condition and self-centeredness upon which it is founded." In his Summa Theologica, Saint Thomas Aquinas defined sloth as "sorrow about spiritual good" and as "sluggishness of the mind which neglects to begin good... [it] is evil in its effect, if it so oppresses man as to draw him away entirely from good deeds." According to the Catechism of the Catholic Church, "acedia or spiritual sloth goes so far as to refuse the joy that comes from God and to be repelled by divine goodness." Sloth includes ignoring the seven gifts of grace given by the Holy Ghost (wisdom, understanding, counsel, knowledge, piety, fortitude, and fear of the Lord); such disregard may lead to the slowing of spiritual progress towards eternal life, to the neglect of manifold duties of charity towards the neighbour, and to animosity towards those who love God. Unlike the other capital sins, in which the sinner commits immoral acts, sloth is a sin of omission of desire and/or performance. It may arise from any of the other capital vices; for example, a son may omit his duty to his father through anger. While the state and habit of sloth is a mortal sin, the habit of the soul tending towards the last mortal state of sloth is not mortal in and of itself except under certain circumstances. In the Philokalia, the word dejection is used instead of sloth, for the person who falls into dejection will lose interest in life. It is also one of the five hindrances in Buddhism. Emotionally and cognitively, the evil of acedia finds expression in a lack of any feeling for the world, for the people in it, or for the self. Acedia takes form as an alienation of the sentient self first from the world and then from itself. Although the most profound versions of this condition are found in a withdrawal from all forms of participation in or care for others or oneself, a lesser but more noisome element was also noted by theologians. From tristitia, asserted Gregory the Great, "there arise malice, rancour, cowardice, [and] despair..." Geoffrey Chaucer, too, dealt with this attribute of acedia, counting the characteristics of the sin to include despair, somnolence, idleness, tardiness, negligence, indolence, and wrawnesse, the last variously translated as "anger" or better as "peevishness". For Chaucer, human's sin consists of languishing and holding back, refusing to undertake works of goodness because, he/she tells him/her self, the circumstances surrounding the establishment of good are too grievous and too difficult to suffer. Acedia in Chaucer's view is thus the enemy of every source and motive for work. Sloth not only subverts the livelihood of the body, taking no care for its day-to-day provisions, but also slows down the mind, halting its attention to matters of great importance. Sloth hinders man in his righteous undertakings and becomes a path to ruin. According to Peter Binsfeld's Binsfeld's Classification of Demons, Belphegor is the chief demon of the sin Sloth. ^ a b Lyman, Stanford. The Seven Deadly Sins: Society and Evil. p. 5. ISBN 0-930390-81-4. ^ Thomas Aquinas. "The Summa Theologica II-II.Q35.A1 (Sloth)" (1920, Second and Revised ed.). New Advent. ^ "Paragraph 2094". Catechism of the Catholic Church, Second Edition. Libreria Editrice Vaticana. 2012. ^ a b Manning, Henry Edward (1874). Sin and Its Consequences. London: Burns and Oates. pp. 40, 103–117. ^ a b Lyman, Stanford (1989). The Seven Deadly Sins: Society and Evil. Rowman & Littlefield. pp. 6–7. ISBN 9780930390815. ^ Encyclopedia of Demons and Demonology, By Rosemary Guiley, p. 28-29, Facts on File, 2009. ^ Backus, Dr. William (2000). What Your Counselor Never Told You. Bethany House. pp. 147–148. Wikimedia Commons has media related to Sloth. Look up sloth in Wiktionary, the free dictionary.